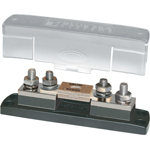 The Safety Fuse Block fulfills a need for in-line main or branch circuit protection for 30A–200A circuits The AMI®/MIDI® Safety Fuse Block uses AMI®/MIDI® fuses. This relatively new fuse is extremely economical and compact, and offers a clear window for visible indication of blown condition. 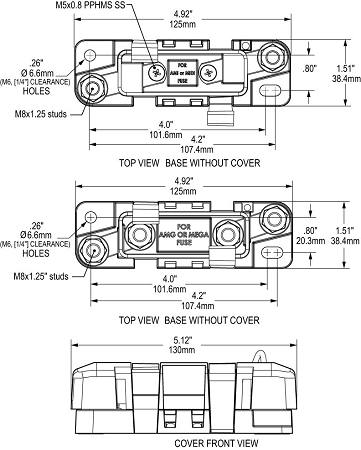 AMI®/MIDI® fuses available through Blue Sea Systems have a 5000A interrupting capacity, making them suitable for both main and branch circuit protection. Ignition protection is the core feature of this product. 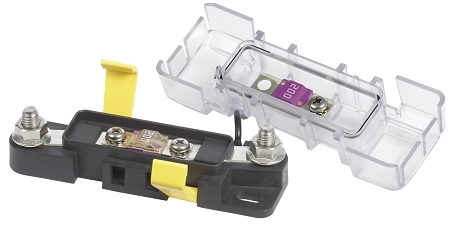 Using ignition protected devices where required is essential for safety and regulatory compliance, and this SafetyHubs Fuse Block is ignition protected to SAE J1171 and ISO 8846. They are safe for use in engine compartments and other locations on gasoline or diesel vessels where a potential fuel source may be present. 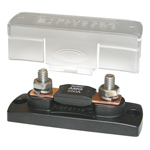 Screw termination for secure connections, a tethered fuse cover with positive latching system, and tin-plated copper busing make the Safety Fuse Blocks a reliable and safe part of a boat’s electrical system.